Former Defense Department acquisition official and private-industry veteran Alan Thomas was sworn in Monday as commissioner of the Federal Acquisition Service, just two weeks after incumbent Tom Sharpe abruptly resigned. Sharpe’s resignation followed acting General Services Administration chief Tim Horne’s announcement that the agency’s newly stood-up Technology Transformation Service would move into the Federal Acquisition Service (FAS) as part of President Trump’s efforts to streamline information technology acquisition. 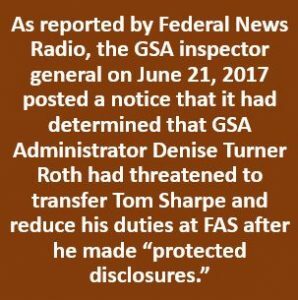 Horne during Monday’s ceremony at GSA headquarters’ “historic administrative suite” acknowledged the three previous FAS commissioners — Sharpe, Steve Kemp and Jim Williams — since the unit was created in 2005 via a merger of the Federal Supply Service and the Federal Technology Service. Horne exulted that – after six months on the job at a desk that sits alongside others in the agency’s open-office bullpen – he finally got to use the high-ceilinged wood-paneled room that was built a century ago for powerful Interior secretaries (and where the 1920s Teapot Dome oil royalties bribery scandal was said to have originated) for the swearing in. For Federal Supply Schedule (FSS) procurements, agencies are not required to evaluate past performance references of subcontractors, unless the solicitation provides otherwise. 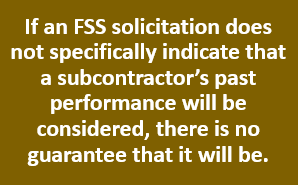 As one offeror recently discovered in Atlantic Systems Group, Inc., B-413901 (Jan. 9, 2017), unlike negotiated procurements, where agencies “should” evaluate the past performance of subcontractors that will perform major or critical aspects of the contract, offerors bidding under FSS solicitations should not assume that a subcontractor’s past performance will be considered. 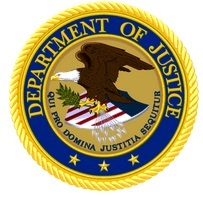 Atlantic Systems involved a solicitation for technical, engineering, management, operation, logistical, and administrative support for the Department of Education’s cybersecurity risk management program. The solicitation was set aside for SDVOSB concerns that held Schedule 70 contracts. Pursuant to the solicitation, offerors were to be evaluated for both corporate experience and past performance. 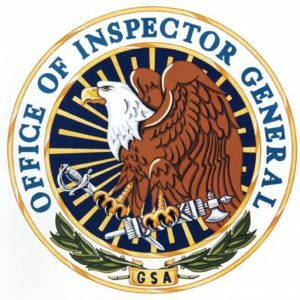 In order to enable the agency to conduct the past performance/experience evaluation, each “offeror” was to provide evidence of the experience “of the organization” with similar projects or contracts.